Oh baby! New Zooby’s Babies products! 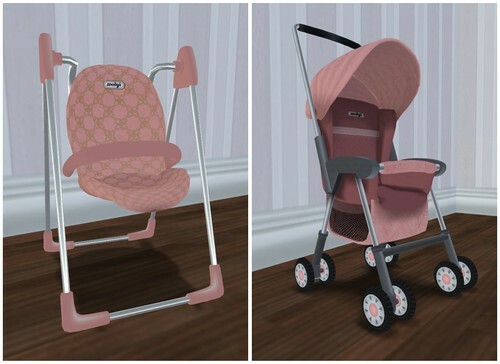 Back in March, I featured Zooby’s Baby Chris on my blog and lots of you guys either love it or you were unsure.. but I have to tell you, even though I don’t play SL families, I really really am fascinated with the Zooby’s line of baby products because they’re the best Lindens can buy — the Rolls Royce of SL babies products. When I rezzed my Zooby Baby a couple of days ago, it prompted me for an update. Since I haven’t seen my baby in a couple of months, I still had version 1.0 but the update sent me a version 3.1! The baby includes even more features and the scripting is more efficient (less lag). All Zooby Babies have free updates forever — I.love.that! I haven’t been to the Zooby’s Babies store in forever as well, so I decided to go have a peek and see if they have any new releases. The last time I was there, they had released their final baby (I think it was the Vampire one….) but I had been waiting for a stroller. I was beyond excited when I saw not only strollers, but carriers, swings and a whole clothing line!!! The store is so posh!!! 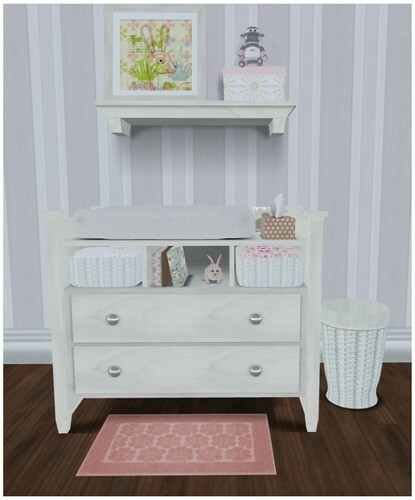 I have the pink Baby Girl bedroom set for my baby, and I noticed that the crib and changing table had been updated to version 2. I upgraded from my version 1 because version 2 is scripted to allow more babies to interact with the furniture — and the changing table now includes a *great* animation sequence! You really have to demo it to see the quality of this product. How can you tell if your changing table is scripted or not? The version one does not have the mat or trash can — so if you have one of those, do upgrade! The new version is much more fun. Check it out! My first virtual diaper change! I called my baby to the table, via the super easy to use menu, and stood on the mat to start the changing process. Everything you need (diaper, wipes, powder) is all included in the table. I was on a decorating high so I went ahead and built my baby a new bathroom. 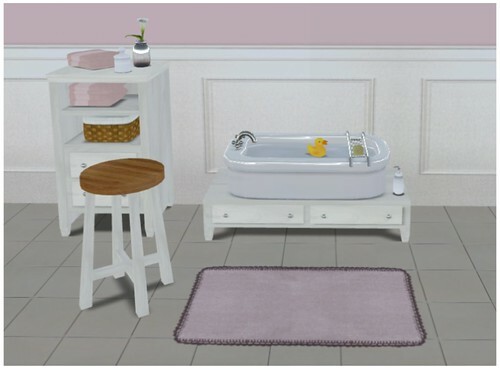 The Bloom bath set has a scripted bathtub that includes bathing animations and accessories. Baby’s first bath! Bath time fuuuun!! The animations for the ‘Mommy’ is adorable!!! Bubbles! I looooove this Bath set. All Moms in SL should have one, it’s loads of fun. 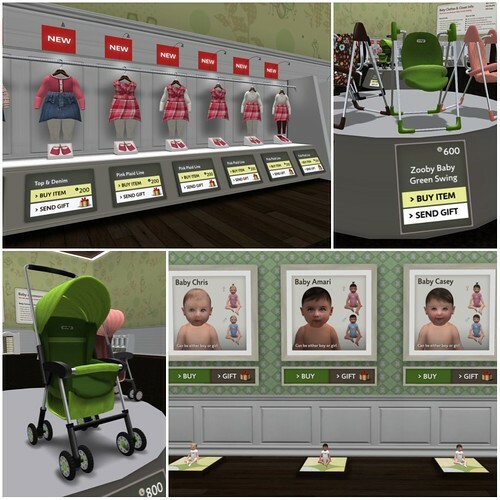 If you know someone in SL that is pregnant — get them a Zooby Baby and Zooby’s Babies items — I know I would totally want these if i was. They’re the best in SL. I wanted to show you guys the carrier, swing, and stroller, but I’ll feature these and more in part 2 of this post… til next time! Visit Zooby’s Babies at the new Zoobyville main store! *dies of cuteness overload* Oh, I don’t bother about that baby roleplay in SL, but it sure looks well done. Especially the bathtub. If it’s still a SL, I might perhaps get one when the kids are moved out, but still hasn’t given me any grandchildren. Wonder of SL and Zoobys will still be around…. version 69.8? Yeah I don’t RP the whole SL family thing, but I still think the zooby babies are one of the most brilliantly made products in SL. It’s all a nice distraction to play with to pass time. We need more cool interactive things to play with. I buy mine from Zooby (Carrie Tatsu is the creator). You cannot actually “make” one in SL, lolllllllllllll…….